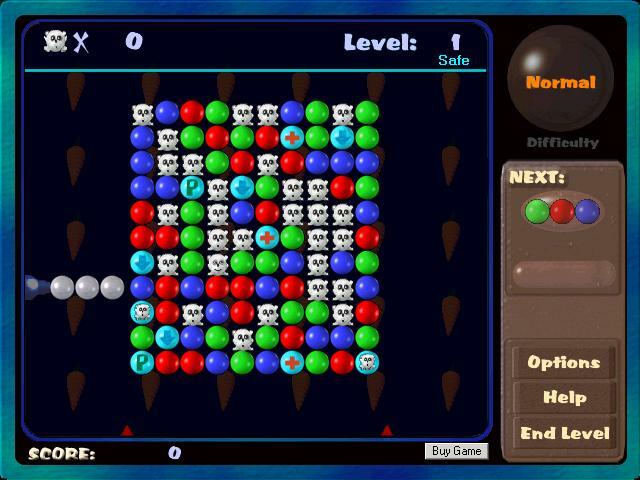 Save the Meeklits is a fun puzzle game that is fun for the whole family. There are little white creatures (Meeklits) that are trapped between different colored bubbles. Your goal is to free them all. This is a lot easier said then done. There is a bar that drops and if it hits the bottom, you lose. However, for every Meeklit you save, the bar will be raised a little higher. You can shoot three bubbles at a time and you can rotate your shots horizontally and vertically. The clear bubbles will destroy any color and the higher you get in levels, more colors will be added. This game is both fun and challenging! When you start the game you can select your difficulty. The higher the difficulty the more points you\'ll earn. In the options area you will see a setting to play full screen, there\'s a rapid fire mode (quick shots), finally you can enable/disable sound. The controls are fairly easy to use. You use your mouse to move your bubble gun around, and you click to shoot it. Like Tetris, you will get points for every row you clear. What is in the full version? The demo is limited to seven sessions. The full game allows unlimited play with no nag screens. The insane difficulty mode is unlocked as well. Finally in the full game all five bonus Meeklits are available. The full version of the game is $15 and well worth it in my opinion. From a Christian perspective this is a very clean game and can be enjoyed by everyone and by people of all ages. This game ran great on my system. Although there are no system requirements for it, I believe that it should run fine on and Windows 9X or higher machine. It ran very stable for me with no crashes. The only graphics glitch I encountered was when you change to full screen for the first time, the graphics distort a little. The background music was very cute and fit very well with the game. Save the Meeklits is single player only but for $15 it\'s a good buy. It will keep you busy and entertained for a while. I highly recommend this game for any puzzle game enthusiast!